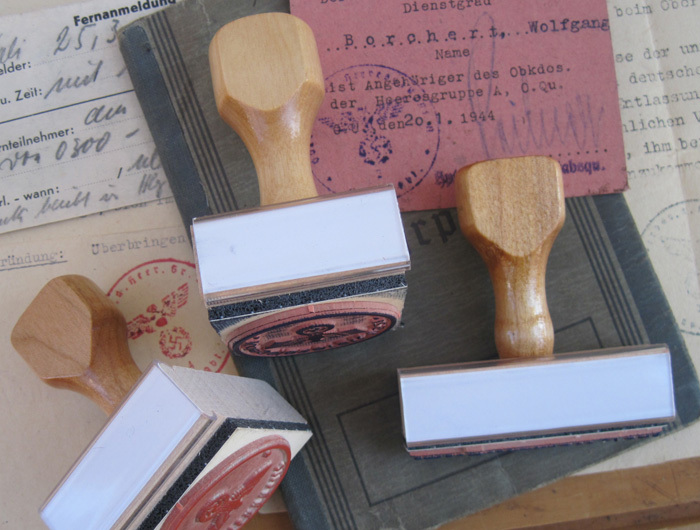 We can provide custom-made rubber stamps for completing WWII German reproduction paperwork for living history, reenactment, props and displays. We have copied original stamps for military and civilian identification documents such as the Soldbuch, Wehrpass, Kennkarte, and Reisepass, as well as Feldpost stamps and all kinds of various stamps for paperwork and even maker marks for uniforms and equipment items. If you have a good scan or photo of an original stamp, it may be possible for us to make an exact replica. In some cases original stamps for specific military units or political organizations may not be available to copy. We can generate new stamps with period fonts using all the correct characters including ligatures and the two different German characters for "s". We can speak German, we maintain a large collection of original documents for reference, and we guarantee our work to be free of mistakes. 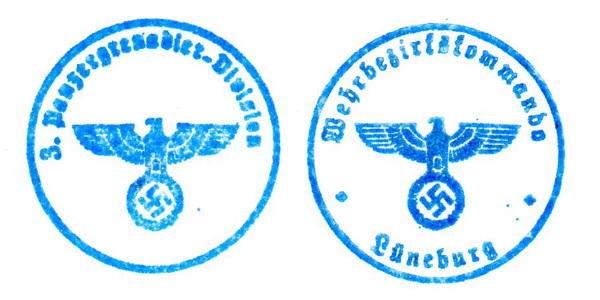 Please contact us about any WW2 German rubber stamp you need. To inquire about ordering stamps please e-mail. All rubber stamps have wood handles as shown and are suitable for reenactment use. The stamps will fit in all standard stamp holders and stands. 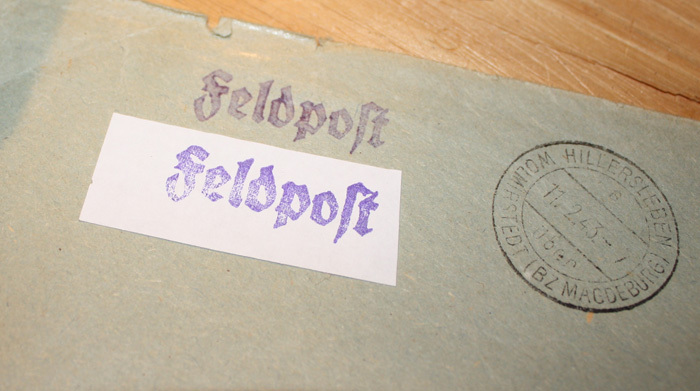 Here is an example of a stamp we made for Feldpost letters using a surviving original letter. Looking for cancellation stamps for reproduction Feldpost letters? We have them! 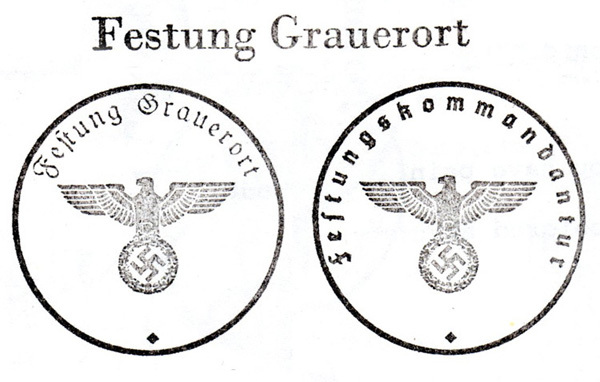 To see more examples of reproduction stamps we have created using graphics from original Third Reich documents, please see the links below. Looking for sets of stamps to work on the Soldbuch, Wehrpass, Feldpost, and other WWII and Nazi era civilian and military documents? Check out our new Stamp Sheets. An entire set of unmounted wartime stamps for just $49! Here are a few various stamps we created (both round Dienststempel service stamps, and line unit stamps) where useable images of original stamps were not available. The eagle graphics, size, spacing and fonts were all closely matched to similar original stamps. Stamps can be made for any unit or any purpose you desire. For Feldpost number stamps, we can in most cases provide you with the correct number for your unit. The stamps are laser etched from high-resolution line art for crisp details and legible text. If you don't require a specific custom stamp for a particular unit but are looking for a generic stamp suitable for a number of purposes, check out our Feldpost number stamps. Pricing: Most custom document stamps are $22.00 each, complete with a wood handle. Very large stamps are more expensive, e-mail us for a price quote. Prices do not include shipping, the shipping cost will depend on the size of your order. The cost to ship one or two stamps is $5 in the USA or $15 to Europe via normal air mail. We are happy to ship anywhere. Ordering Information: E-mail us at intrenches1945@gmail.com to place an order. You can supply your own artwork or we can create the artwork and send it to you for approval before we make the stamp, our reference collection contains a large amount of paperwork including all the most common WWII-era German identity documents. Turnaround time is usually around one week. We can accept money orders and payment through PayPal.